I will use the machine for milk based espressos only! Need to stick with a 58mm pf as I have purchased matching pullman basket and tamper so needs to fit that! I am not fussed if I find a more pricey machine that is 2nd hand that ends up landing in this range cause it's not new! I'm Sunshine coast/Brisbane based so if anyone does have anything for sale and is happy to post then more than willing to weigh that option up too! Have you had a look at this? Might be selling my BZ02 soon which will be in that price range. The only thing stopping pulling the trigger on a new machine is that it's still making awesome coffee. Not convinced I'm going to get much improvement for spending $2k. This might be the trigger for me. I can PM if you want details. I reckon you should stay with what you have got until your budget is about 5x more as a starting point. Anything new you swap to (not an upgrade) will take a lot longer to warm up, chew more power and have less temperature stability (why do you think chem labs use oversized thermoblocks / thermocoils instead of boilers? - they have far better temperature stability and consume a lot less power). If you are thinking of going to a "standard commercial / prosumer" machine later, no way the skills of a small single boiler are more readily transferable - actually a lot less if anything (speaking as an ex Miss Silvia owner). Going secondhand on such a small budget is highly unlikely to buy anything other than trouble - unless you "just lurv" restoring broken machines in your spare time while going without a cuppa - or using the 6910 anyway whilst doing the repairs I guess. Converting your p/f to a naked, adding VST baskets and/or spending your money on a better grinder (if you haven't already done all of those) would lead to far better coffee. PS: FWIW, I reckon your next big step up is a top quality manual lever (think Olympia Cremina with all the "learning / temp surfing grief" that implies at first) or a Decent DE1+. Wow, my potential offer just got shot down in flames by another poster within 5 mins. Looks like I'm sticking with my "broken machine". Having used a single boiler machine (Rancilio Silvia) for twelve years to my general satisfaction, I have switched to an HX machine (DB was too big for the space) for the obvious advantage of being able to produce both coffee and milk without compromising flavour or temperature of either to the same degree. I think the Silvia is a great machine and will always commend it, provided one can not afford to spend three times as much on small but important advantages. Silvia was my entry level. I find it hard to agree with anything less. I agree with the comments about the importance of your grinder. That was very significant for me. I would not have bought the Silvia had I not afforded a Rocky at the same time. The Rocky is in great shape today and would reasonably serve for decades yet. I was writing mine before you posted... Didn't even see yours until now. T.
Yeah I've seen a few Silvia's. Worth buying with the PID added? And what's the difference between say v3 v4 and v5? And yes I also have a rocky doserless which I'm having a chute made up to access the hole to clean easier and not drop down as far as had pf issues of filling up and having it knock out of the basket. Would the Silvia though be an upgrade as such over my 6910? Obviously a different machine but does it use a 58mm pf? The PID may well be worth it. I would be tempted if I were not changing, and considered seriously whether I should add it before passing the machine on in the family. At the moment, I am sticking with a full clean and replacement of seals. I have not compared versions after my V3 because I doubt a later version would be a significant upgrade. I did, though, buy a V5 steamer knob when mine broke; much better. - You will be buying in this price ballpark now and for a while: Moot. I might switch to a Silvia. See the next. 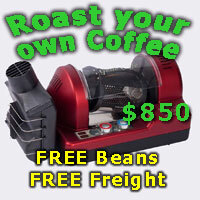 - The 6910 is failing or coffee from it is less than satisfactory, with no current intention to spend a lot more: Switch. - The 6910 is still working and you wish to spend more on better: Keep the 6910. Save for an HX or DB machine. Yet your message is still the same. That anybody who buys a 2nd hand is only buying junk. A little insulting to any of us who properly maintain their equipment. I had a 6910 and got rid of it when I bought the Bezzera. Don't regret it for a second. Far superior machine. Last edited by arcachon; 29th July 2018 at 10:09 PM. My original post stated "Going secondhand on such a small budget is highly unlikely to buy anything other than trouble" - a comment I stand by in general. Later, when I spotted your post it was very late so I didn't do a full reply - I felt timeliness was more important than a full answer (before an unintended flame war erupted). Reminds me of an early Star Trek episode when Kirk, faced with a few poor options comes up with "Gentlemen, I need another alternative!" - you just provided it. By far the best alternative in terms of value for money is to pick up a secondhand machine from someone trusted. A friend you know, a good dealer - they exist, a CSr who takes care of their equipment - about 50% from what I gather. I also look after all my gear, so in hindsight my comment was also a little too generalised. Your "potential offer" may well be what FilthySudo needs / wants today. arcachon, saeco_user, inorog and 1 others like this. Thanks for elaborating Tampit. What you’re saying there I do agree with. When buying 2nd hand the lower the budget the greater the risk of getting a dud. Especially if going via public sites like Gumtree and EBay. You really have no idea what the history of those items is.